Use Bread spreads to evaluate the cost and usage of your favourite spreads. You enter your kitchen, make a cup tea, grab a few slices of bread and you reach for your favorite Nutella jar. Here it is, you open it while sipping your tea and suddenly the feeling of horror appears on your face. The jar is empty. Again! That's already the 4th one this month, [insert_name_here]! - you shout. Sounds familiar? Those sweet goodies disappear faster than we can predict and we, addicts, can't do much about it. 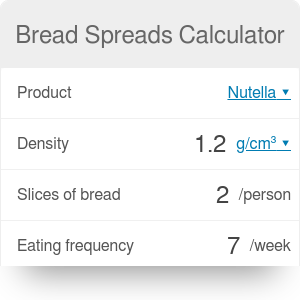 However, to help you keep track of your spendings on Nutella, peanut butter, jams, hummus, and some others we developed this simple calculator. As you have the density and weight, you can also use our grams to cups converter, to change from teaspoons to cups. Next, tell us how many slices of bread you put the spread on (crackers will work too!) and how many teaspoons you treat each with (for the purpose of calculation we use here American teaspoons equal 1/3 of American tablespoons or 4.9289 ml). Tell us also how many people in your household share your addiction and how many times per week you eat those sandwiches (we put 7 days per week as default but feel free to change it!). Finally - add information about your jar/container capacity and its price. Our tool will tell you how long it will last and how much you could be spending on these. For the purpose of making accurate calculations we used product density and weight provided by Aqua-calc.com. We set 3 as the default number of teaspoons used based on various online sources but of course this number can be adjusted based on your needs (and how hungry you are!). Keep in mind that values are approximate and don't risk not having your favorite spread because the calculator told you it will last for one more day. Bon Appétit! Bread Spreads Calculator can be embedded on your website to enrich the content you wrote and make it easier for your visitors to understand your message.